← Does reading change your brain? Posted on December 28, 2013, in Classics Club and tagged Classics Club, John Steinbeck. Bookmark the permalink. 25 Comments. You’ve almost convinced me! I’ve always wanted to read Steinback and did in school (The Red Pony), but I don’t really remember it. I’ll start with this and see if I can then maybe do The Grapes of Wrath. I’m now feeling the weight of responsibility Geoff – hope I have not led you down a path you don’t enjoy. BTW I recently also read Cannery Row and loved that too. Glad you enjoyed it. I really liked the book when I read it back in high school but what has stuck with me most was seeing it as a play around the same time. It was a very moving experience. Beautiful review. I couldn’t agree more about the sense of inevitability, and I believe that Steinbeck’s ability to achieve this constant tension throughout the book is what makes him such a good writer. I’m glad you discovered how great he is! Fantastic! Make sure you follow Cannery Row with Sweet Thursday, it’s a wonderful sequel. Thanks for your review. I loved this story – but am a bit of a Steinbeck fan, having read the Grapes of Wrath (once as a teenager, once as an adult) and also Cannery Row. The Grapes of Wrath ending always stumped me – but I did enjoy the novel overall. Cannery Row I just finished and I loved it so I was thinking of working myself up to another go of Grapes of Wrath. Now you’ve intrigued me Lucy about the ending. I’ve never read this though always meant to. A few years ago I saw a play of it here in Birmingham, Matthew Kelly played Lenny and was outstanding. quite a lot of people seem to have seen a stage version, Ali.I’ve never noticed it as a production myself but will be keeping an eye out. it’s on the schools’ syllabus so I’d expect it to come around at some time. I’ve not read any Steinbeck and would have automatically avoided him thinking that he was best read when a teenager. I’m not sure I’m going to pick him up now, but if any of his books turn up on a book group list perhaps I won’t be as disappointed as I might otherwise have been. Many of the books our club has read lately have been very disappointing but if it hadn’t been for the club I wouldn’t have ever picked up the Steinbeck. And then I would have gone through life thinking he was a miserable old geezer. 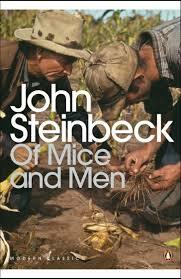 This is one of Steinbeck’s works that I am yet to read. Unlike you I loved Grapes of Wrath and also East of Eden – and really like The Moon is Down too. that’s so funny that there would be such a reaction… it is in fact a worhtwhile read. Some people have already seen the black and white Hollywood version and get depressed but it is at base a tribute to the human spirit…. don’t you think?